This is an easy yet full of protein recipe suitable for anyone! Enjoy! Chefs’ Note: If you suffer from heart disease, high cholesterol, high blood pressure, or have a nut allergy, skip the pecans! Yield: Serves 2 as a meal. In medium saucepan, bring 1 cup of quinoa, cinnamon stick, and 2 cups of water to a boil. Cover and simmer for 20-25 minutes until the quinoa ‘tail’ is visible and the water is absorbed. Let sit covered for 5 minutes and fluff with fork. 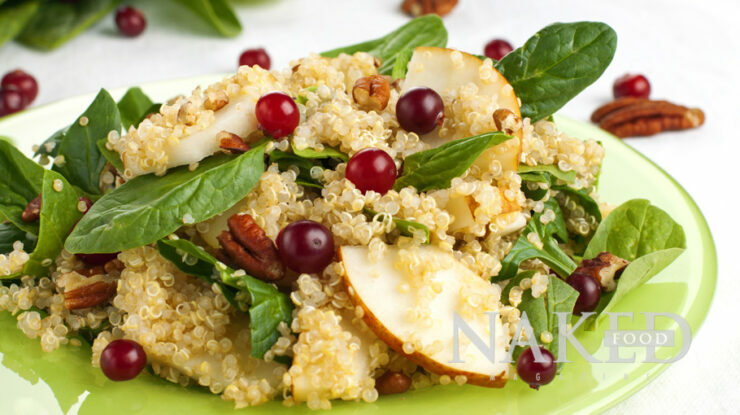 In a glass bowl, mix in quinoa, spinach, and pear slices. Serve and top with berries and pecans. When I read the Chef’s note….that if you have high cholesterol, skip the pecans, would you please enlighten me! 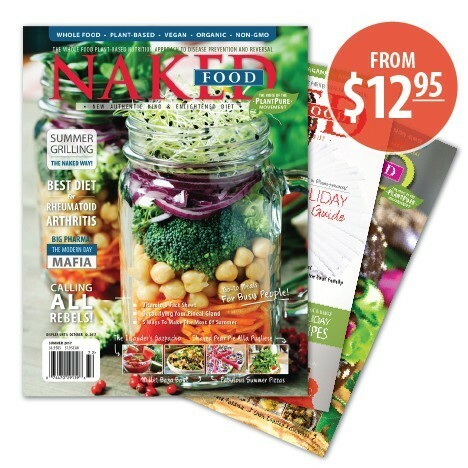 I have eaten healthy with nuts and seeds, nut butters etc. but have been baffled why my LDL cholesterol is so high. This is the first I have read about an association with pecans and high cholesterol! Where can I find out more information about that PLEASE. Perhaps I need to cut out all nuts, seeds, nut butters for high cholesterol??? Thanks for any advise/ further info you can provide to my email address. Hi Lin! 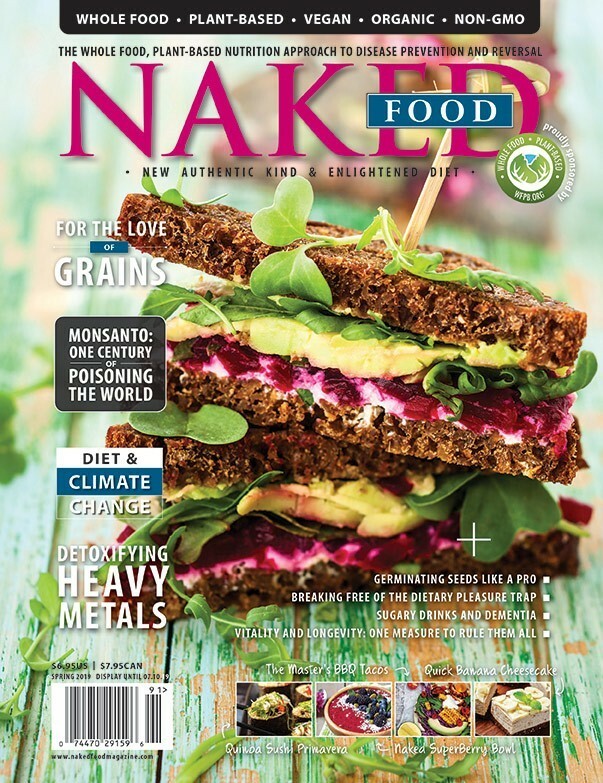 If you have heart related conditions (high cholesterol, high blood pressure, clogged arteries, etc) it is recommended to follow a starch-rich, whole food, plant-based diet without any saturated fats, even if they come from plants such as nuts, oils, most seeds, and whole foods such as coconuts, olives, and avocado. Acceptable seeds include chia and flax. Once your cholesterol is back to normal you can add these types of foods sparingly except for oils. Oil is the one food that should be avoided at all costs and at all times, always. Your diet should always be oil free. 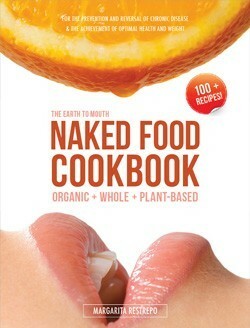 Naked Food follows the guidelines of Dr. Caldwell Esselstyn for the prevention and reversal of heart disease. Please take a look at the common Q&A from his website here.